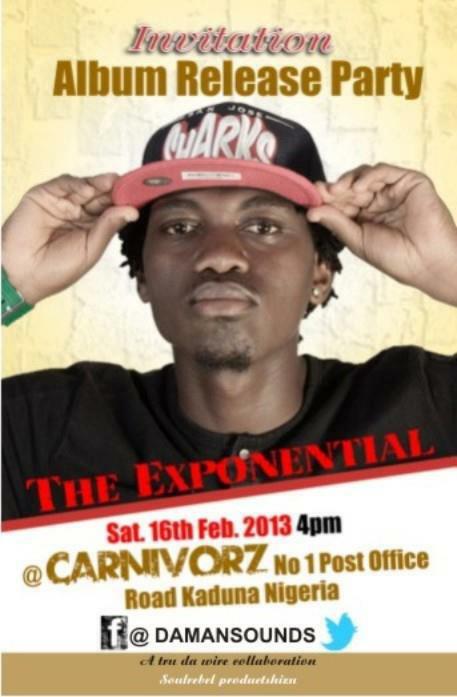 Daman Sounds Album Release Party for “The Exponential” 16 February 2013, 4pm, Carnivorz, Kaduna, Also Peace Concert in Rayfield Resorts, Jos, 6 February. ALSO ….V-TYME(AUSTRIA)…. YOUNG FACE,X-RAY,DADDY SHINE(ABUJA)…..,APHSIS THE VICE PRESIDENT,DAMAN SOUND(KADUNA) )….DADA,JIFERAH, DADDY D(LAGOS) ETC BLAZE THE PLACE. To listen to Daman Sounds music and find out more about him, check him out on Sound Cloud, Myspace, Facebook, and Twitter. Here are a few of his recent tracks. Past appearances include the July 2011 Ade Bantu Lagos-Kano HipHop connection workshop and concert held at the Goethe Institut, Kano.